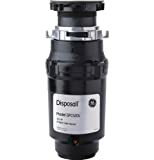 When you are shopping for quiet garbage disposal, the first and most important consideration will be the decibel rating. The decibel rating is just the level of noise that the device is going to produce. Of course, noise isn’t the only thing that needs to be taken into consideration. There are other components and features that must be considered and that is what you are going to learn about below. Is That Sound Seal Plus? 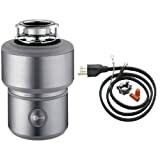 When shopping for quiet garbage disposal another factor you want to consider is the vibration. Disposal can create quite a bit of vibration when the motor is active, and that is where a lot of the noise will be emitted. This is why it is important to look for models that offer sound seal isolation techniques. These brands of disposals will come equipped with anti-vibration tailpipes and sink mounts. Some manufacturers will provide further sound reduction by installing sink baffles. Sink baffles can lock the disposable in place and significantly limit the amount of vibration. It is essential to choose disposal that will have the power to grind the food scraps and leftovers that you are accustomed to dealing with. The power of the motor will be rated in RPMs and horsepower and the higher you go, the more power the device will produce. That being said, it is important to remember that the higher you go, the louder the unit will be. If you aren’t going to be grinding chicken bones or harsher items, you might want to still with a less powerful motor. In fact, most of the time these less powerful motors are so quiet that the manufacturers don’t even have to add extra features to mask the sound of the device. Disposal with a one or two horsepower motor will offer the most power that you will find on the market. These models can endure heavy use and won’t have a problem dealing with solid food waste. They also almost never jam. A 1/3 horsepower will be the weakest model that you will find available on the market. They are also the quietest and the most popular. In addition to this, they are more affordable. They might not be able to handle the harsher food items, but there is still a lot they can grind. When shopping for quiet disposal, you have to consider the decibel rating. The decibel rating is the noise level that the device produces. The lower the rating, the quieter the device will be. If you want super quiet disposal, you will seek out one with a low decibel rating. You just got much information thrown at you and probably are still trying to digest it. That is why this guide will provide comprehensive reviews of some of the quietest garbage disposals on the market. It will mention the components and features that the models so quiet. 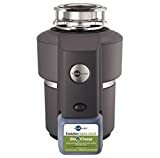 The InSinkErator Evolution Excel 1.0 is without a doubt an impressive device on its right. The fact that it is backed with a seven-year warranty doesn’t hurt the overall selling point of the device. The warranty isn’t just your standard warranty either. It covers free hour calls, parts and labor. That being said, the most impressive thing about this device is its power and noise reduction technology. The InSinkErator Evolution Excel 1.0 does have a one horsepower motor, but what’s even more impressive is that the multigrid technology also adds more power and efficiency to the device. The disposal uses three stages of technology to grind your food and break it down into smaller particles. The device can truly power through fruits, small bones, vegetables, peels, celery and almost any type of imaginable leftover. Yes, one horsepower motors are typically loud, but the Excel excels when it comes to noise reduction. 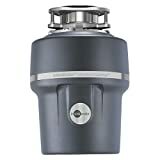 This disposal includes advanced levels of insulation, vibration reducing connections and a special quiet collar sink baffle that blocks all the noise and vibrations that might be emitted by the device. 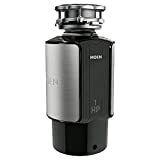 We also considered this device as one of the best garbage disposals for deep sink, so it will fits at almost all kitchens. The L-8000 garbage disposal features a high strength, corrosion-proof polymer grind chamber and stainless steel components. The device will resist any rust and provide many years of quiet operation. The power in combination with the sound reduction technology makes this powerful device a must have for any family of four. With a one horsepower motor that is capable of producing 2800 RPMs, you won’t have a problem grinding those troublesome table scraps into dust. So it will do it in just a matter of seconds. The magnetic motor not only reaches its maximum speed levels almost instantaneous, but the power alone reduces the possibility of jams. The magnetic based motor not only contributes to the power of the device, but it helps with the decibel levels as well. The bearings and moving parts are lubricated thoroughly to reduce friction and noise levels, but what’s most impressive is the additional layers of thick insulation. The extra insulation goes a long way to reducing the sounds and vibrations of the device. If you are looking for quiet operation, quality, affordability and convenience, look no further than the General Electric GFC520V Disposal. This device includes all the powerful and necessary sounds reduction properties that any homeowner needs. This disposal only provides ½ horsepower, but this is just one of the many things that contribute to its sounds reduction qualities. That being said, the ½ horsepower should fool no one, because the motor will provide sufficient power and torque to grind through a variety of waste materials. The powerful grinding capabilities of this device make it suitable for any sized septic system. With the advanced insulation technology that went into this device, you could run it during a dinner party and no one would be interrupted. The advanced insulation technology not only covers the moving parts in thick insulation, but it ensures that the device stays super quiet during operation. When it comes to garbage disposals the InSinkErator name has become a household name. Moreover, it is easy to see why with everything that they have to offer. Speed, power and soundproof operation all wrapped up in one neat little package. There are several components that went into making sure that this disposal performs at the lowest decibels possible. The advanced level insulation covers all the moving parts, the vibration reducing connection keeps vibrations at a minimum, and the quiet collar connection ensures that it blocks any noise that could come from the sink. The XTR not only features a ¾ horsepower motor, but it comes equipped with 2X MultiGrind technology. The two stages of grinding ensure that every little bit of table scrap and leftover is nothing more than a speck of dust. If you are looking for power and quiet operation all in one unique package, you cannot overlook the Moen 1000X. The device includes all the essential soundproofing features that make it the perfect solution for anyone with PTSD or severe migraines. This disposal might only be rated to produce ¾ horsepower, but it is the Vortex motor that is the powerhouse behind the device. The magnetic motor incapable of reaching full torque within just a matter of seconds, making it effective and electrical cost friendly. The powerful 2,800 RPMs produced by the motor won’t have a problem grinding the most common table scraps. The sound shield technology only adds to the overall quietness of the disposal. The extra thick insulation wrapped around the device will reduce the hard work of the motor and make it just sound like a hum. Motor rotates at 1725 rpm for effective grinding. The design adds a measure of safety because it has a cover that must be locked in place before the disposer will run. When it comes to one horsepower motors and garbage disposable most homeowners associate these qualities with a noisy operation. Also, that is true for the most part, but the 100T defies the standards. The most impressive thing about the 100T is that it is equipped with a sound seal plus technology. This technology not only includes extra insulation installed around the moving parts, but it provides anti-vibration components and anti-vibration tailpipes. These components make for a quiet overall operation even during the most strenuous grinding sessions. The motor in the 100T is capable of operating at 1735 RPMs, which is pretty impressive amongst the garbage disposal community. Not only will this one horsepower motor dispose of most table scraps, but it will provide the efficiency that will help save on electrical costs and wear and tear of the motor. The Evolution ¾ HP Disposal is not only backed by an impressive four-year in-home warranty, but it includes essential components and features that make it an essential device for any quiet home. The MultiGrind technology helps reduce food scraps into a fine dust that can be discarded in the smallest of septic systems. This in combination with the ¾ horsepower motor provides all the power that you need to eliminate many food waste materials. The Sound Seal technology incorporated within this device makes it stand out amongst the competition. The extra levels of insulation, vibration control devices and quiet collar installation make the Evolution disposal one of the quietest on the market. If you want to entertain and keep a clean kitchen at the same time, you will opt for the Evolution disposal. Why Is It Important To Invest In A Quiet Garbage Disposal? There really are tons of reasons that one would want to invest in a quiet garbage disposal. Of course, the first reason is the most obvious and that is the noise levels. Running a loud garbage disposal during the evening hours could disrupt the sleeping habits of a young child or an elderly individual. This is even so true during the daytime. You wouldn’t want to wake your child from that much-needed nap would you? Another benefit that comes along with investing in the quietest garbage disposal is that it might save you a little money on electrical costs. These disposals are designed to work in short bursts, which means they don’t consume as much power as a continuous running device. A soundproof disposal with the right components can even increase the overall value of your home. If you even sell the home pointing out the soundproof garbage disposal will be an excellent selling point. Individuals that suffer from severe PTSD, anxiety and migraines can be susceptible to loud noises. Just the instant shock of the garbage disposal can bring on unwanted symptoms. Switching to a quiet garbage disposal will eliminate the chances of this happening. What Are The Benefits Of Investing In A Quiet Garbage Disposal? The biggest benefit that you will receive from investing in a quiet garbage disposal is that you won’t have to worry about the noise. You can literally run the machine around the clock without worrying about disturbing the kids or your neighbors if you live in an apartment complex or condo. You also learned in the aforementioned paragraph above that these machines could save your money on electrical bills because they operate in bursts. However, that isn’t the only reason that you should consider switching to a quieter model. A good, quiet disposal with the right components can help reduce odors and messes in the kitchen. The disposal will grind the waste materials into small pieces and send them to the sewage system. You won’t have to leave a stinking bag of garbage sitting in the kitchen for days at a time. These quiet models are also much easier to keep cleaned and maintained. The motors will be easily accessible, so you won’t ever have a problem maintaining or cleaning the machine. In addition to this, these quiet models are excellent for the environment. There are a lot of trash dumps full of waste and other harmful materials that are just further polluting the earth. Plus, using a garbage disposal cuts down of the amount of plastic waste bags that you consume.